today is the april synchroblog and a theme i am really glad we’re tackling together: bridging the divides. the schism within christianity between those of a more liberal persuasion and those from a more conservative one keep getting bigger & bigger. as a post-evangelical mutt, i notice how hard it is to engage in these differences without it feeling personal, judgmental, and tiring. but the reality is that we are brothers & sisters and we have to figure out how to love each other better. the best way to turn the tide in a more helpful direction is to participate in any way we can in healthy communication & work to build bridges instead of bomb them. i wrote a week-long series on this last year, and those posts are on the “healing the divides” series link (near the bottom). 1. remember first, that that person is a child of God, made in God’s image. this is the starting place for dignified dialogue and often gets missed. when we hold each other’s dignity right in front of us, it always helps. 2. take “God says” and “the Bible says” off the table. they are trump cards that immediately create a barrier between us. a much better alternative is “my interpretation of the scriptures is…” “as i engage with the Bible, i personally see…” owning our own views is really important; claiming absolute understanding of God’s views in either direction is unfair. 3. never question someone’s christian-ness. both sides of this divide have been hurt by this assumption. there are lots of ways to be a christian. 4. assume the best in the other, not the worst. this is hard for me because of the stereotypes and frustrations of social media and bad history. it’s easy to always lump everyone together and assume the worst instead of the best. i’m not saying throw out discernment, but when it comes to building bridges, we need to be careful we’re not coming into these conversations with guns already loaded. 5. respect our different biblical interpretations. the Bible is a wild and beautiful book that can be viewed in many different ways. a biblical interpretation different from ours doesn’t automatically mean stupidity or lack of biblical literacy or bad practice or a whole host of other things that can get thrown into the conversation. it’s best to just remember that none of us have an exemption on seeing through the glass darkly, and we each have to make peace with what we believe about the scriptures. 6. affirm what we do love and appreciate about each other. whenever we do pastoral counseling for marriages, we always ask couples to work on affirming the good instead of only focusing on the bad. it’s true, we all need encouragement, especially when so many of these tiring conversations have beaten us down. 7. learn more about nonviolent communication. i can’t say enough about how helpful these tools are (and how difficult they are to apply) but they will help us discover our real needs underneath our strong feelings. often, we have a lot more needs in common than we may think, and nonviolent communication can help with empathy and connection in tangible ways. becoming safer people helps us have safer conversations. 8. be open to learning from each other, be curious. this is hard for both sides but this attitude of humility really helps. i know it can be extra tricky when those of us from a more liberal persuasion started our spiritual journey on the more conservative side and might assume we already know everything over there. i really struggle with this but am trying to be more open to what i can learn from my more conservative friends without just assuming. asking questions, being curious, and deeper dignified dialogue inquiry helps with understanding. 9. embrace paradox. paradox means two contradictory things can exist in the same space. that means we can live together in our differences, in all our strengths and all our weaknesses. we don’t have to squeeze one side out but rather embrace the beauty of our diversity. diversity can strengthen, not weaken, but we have to honor it. the Bible is full of paradoxes, so it makes perfect sense the church would be too. 10. most of all, put relationship above our differences. this is so hard to do online, when we aren’t eye to eye and heart to heart, but we need to try to never let theological differences get in the way of Love when we’re talking about real people in our lives. i’m not saying stay in unsafe or harmful relationships; i’m saying at the end of the day, choose friendship and hope over divides and positions. it’s always worth it. God can sort out all of the details later. and an 11th, because without them, we’re toast. 11. laugh more, hug more. i know these are serious matters we’re talking about, but honestly, we have become so intense that we have missed out on the funny parts, the importance of laughing at ourselves and with each other and then hugging it out at the end of the day. we have got to learn to agree to disagree with love at the center. but these only work when we are friends first. there are so many more possibilities but i hope that some of these foundational thoughts can help build bridges toward each other and heal some of these great divides. 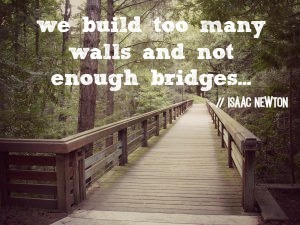 God, help me, help us, become bridge builders instead of bridge bombers. we want to brave & humble & open. i’d love to know what you’d add, too. ps: on wednesday june 11th, my friend and teammate karl wheeler and i are hosting a fun evening called “an evangelical and a progressive walk into a church…” it’ll be a dignified dialogue beyond just our own differences and will hopefully stir up some healthy conversation and bridge some divides. we really can live together in these differences, but it is hard and oh-how-we-need-God’s-help to make it work! it would be fun to catch up one of these days! I’d love to see a comedy skit based on your evangelical and progressive walking into a church Kathy :). Laughter is good medicine – only side effects are an achey belly from exercising laughter muscles – or is that just me? :). What I’d add to your list Kathy are come conclusions I have come to from what I have learned. I too have come from am evangelical background and find myself connected now in a community that is often called “liberal/progressive”. Where I have seen the “word of God” used to bring about truth and freedom it has been beautiful. Equally as beautiful has been where I have seen “justice” and “inclusivity” practiced. Going only on my experiences without anything to back this up from research or any other authority, here is what I have learned. 1. If something is a trigger for me, then that is an indication of something that is need of attention, something that is appropriate for me to take ownership of. I can do that by keeping my heart guarded, and with strong boundaries and chose how I go about addressing what for me is a trigger. 2. I realise that I come to any conversation with my own presuppositions and assumptions based on many things (life experiences, the culture in which I was raised etc.) which govern how I am inclined to interact. And when such values are challenged it is uncomfortable, painful even, but this is how my horizons are expanded. I may have something to learn that someone can teach me through the experience. 3. If someone is convinced they are right about something and I think differently, then no amount of talking will persuade them about the validity of a differing view. If I don’t agree with them I will be “wrong”. So if someone believes God is patriarchal and that provides security and structure or that Jesus is a a liberal and a feminist, and they are right then no amount of giving another view will be a useful time of energy. Better to keep my mouth shut even if that means sacrificing my freedom of speech. So where there are differences keeping my heart guarded and a reign on my tongue, accepting where it would not be wise trying to build bridges and having strong boundaries at such times. At other times discerning where bridges can be built and endeavouring to do so, knowing there is risk that comes with that, which takes courage and leaves one vulnerable to hurt and pain whilst attempting great achievements. It is beautiful when there is a sense of connection, belonging and love. Isn’t that what we all desire? thanks, adam. yes, those desires are so beautiful. We want to build bridges and sometimes that works. Some people however, have made it abundantly clear that they do not want bridges built to the island where they and their little tribe have taken up residence. They might be willing to send a skiff over to the mainland and pick up someone to take to their island, where everyone will be required to think and live as they do in every detail. But no bridges! Some of their tribe has already swum the channel at night to get off the island. Think what might happen if there were bridges. Very good post, though I can’t help feeling a little sad that these things have be written. However, it appears that they do, so keep up the good work. thanks, andy. yeah, it is sad, how ugly it’s gotten. hearing what happens to public figures when they share their beliefs (or even their not-so-sure-what-they-believes) is so painful to witness. thanks for taking time to share. it’s so interesting how that term gets tossed around as some kind of insurance policy. I’m one of those people who can be suspicious when someone talks about building a bridge between those who disagree as I have sometimes witnessed the term “bridge building” to be used as a way to attract people with the agenda of converting them … but I know you don’t mean it that way at all. I know what you seek is right relationships in the midst of all the divisions that we experience. I really love this post and the way you approach it … I have started seeing unity as something that we create at any given moment rather than a destination and these things are all things that work in the moment. 12. We should consider giving up having the last word. I do it sometimes and I witness others doing it … having to have the last word. It is especially prevalent online and it can really cause the conversation to escalate. It has something to do with the desire to “win”. If we don’t have anything significant to add to the conversation please refrain from responding just to have the final say. i absolutely love your additions! so good..so good…. Lots of good, thoughtful advice here and really perceptive comments from other readers. I’ve read through a few of these posts now and there does seem to be a central theme – love. We need to remember that God loves each one of us, no matter where we are on the divide and that we are called to love each other too. Not necessarily agree and certainly not accept abusive behaviour but love, and as Caedmon said, pray for each other. yes, that does seem like the common thread 🙂 thanks for sharing. I enjoyed reading this the closer I got to all of them. I particularly like #8 because we definitely have to be open to much in life in order to succeed.